The other day I published the review of "Shiver" by Maggie Stiefvater, the first book in the Wolves of Mercy Falls trilogy. Today, time has come to review "Linger", the second book in the series. 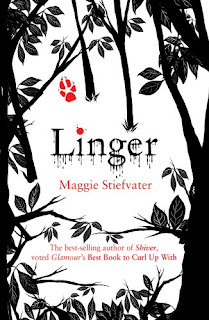 If you haven't read the "Shiver" and do not want spoilers, please do not read this review :-) I'm not afraid to admit that I read "Shiver" more or less in one go (had a few breaks to make tea and dinner and so on) but with "Linger", I did not have that luxury so instead I read it over a few days. The story continues where "Shiver" left off. Sam is now a boy, this time forever. No longer does he have to fear the weather or the cold and he is slowly getting to grips with the implications that this has. Suddenly he has a future and he has to consider what he wants to go with his life - will he go to college? Will he pursue his passion for music? All he knows for certain is that he wants to be with Grace. She is everything to Sam. However, he also has to deal with the fact that being permanently human, he still has a responsibility for the other wolves and with the new wolves that Beck has created, this is a little more trouble than Sam wants. One of these new wolves is Cole. A famous rock musician who screws up everything he touches, he has become a wolf to forget. For him it is the ultimate drug to heal his broken soul. Another person with a broken soul is Isabel. Meanwhile Grace is happy to have her Sam but as her parents are suddenly starting to take an interest in her life, their relationship becomes more and more difficult. To further complicate things, Grace's health is rapidly deteriorating and the doctors can't find anything wrong with her. The situation becomes more and more tense as "Linger" takes us deeper into the story of The Wolves of Mercy Falls. All in all "Linger" is a great sequel and I thoroughly enjoyed it! Hope you will too. Read it if: You read "Shiver". Otherwise read that one first, then read some Rainer Maria Rilke and then read "Linger". Isabel and Cole are a lot more interesting than Sam and Grace! I was uncertain about their introduction but it was handled so well and added a lot of juice to the story. Top Ten Tuesday: Books For the Book Club!